120in³ Muffle Furnace w/ Digital Controller - Gilson Co. 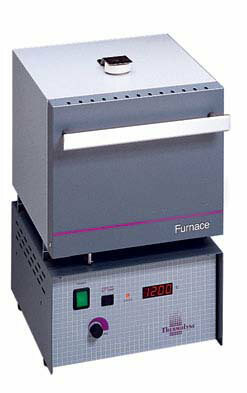 The MF-7910 120in3 Muffle Furnace w/ Digital Controller has a 2L (120in³) capacity with a temperature range of 212—2,192°F (100—1,200°C). Electrical capacity is 240V/50-60Hz/4.2amps. This benchtop unit is equipped with a built-in port that removes moisture and contaminants while extending heating element and furnace life. It also offers thermocouple break protection, two open-coil heating elements for fast and efficient heat-up, thermal-efficient ceramic insulation, oven door safety switch, power cord, and a 0.31in (7.8mm) rear port to monitor chamber temperatures. MF-7915 120in3 Muffle Furnace w/ Digital Controller is identical in size, features and capabilities, but operates on 120V/50-60Hz/8.3amp. Each unit performs well in a variety of applications, including ashing, ignition tests, gravimetric analyses and determining volatile matter. These models are additionally designed for use in testing of soils, aggregates, and cement. The furnaces come with a power cord, hearth tray and digital controller.